Phillip Fredholm was Edward H Bohlin’s premier craftsman and one of the finest silversmiths of the Hollywood Cowboy golden age. Fredholm was also master tool and die maker who is credited with making the top-of-the-line designs for Bohlin’s buckles and conchos in the late 1920s and 1930s. 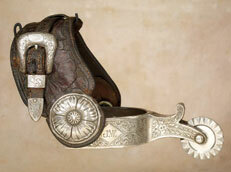 Known to have created Bohlin’s famous Mission saddle, which depicted California’s various historical missions in solid silver and hand chased in bold relief. Phillip originally worked for the legendary Mike Morales when he moved from Portland to Los Angeles and set up his shop at 2213 Sunset Blvd in the late 1920s. After Morales’ death in 1934, Phillip opened his own shop where he created some of his finest work including many prize-winning silver saddles. If you have property you wish to sell at auction, the High Noon team can help you through the process. Below: John Wayne's Personal Bohlin Spurs. Want to see more of what excited Auction crowds in recent years? 1) Like High Noon on Facebook. Sign up to receive Smoke Signals, High Noon’s e-magazine, for collecting and auction news, special features, recipes… and much more! If problems with website occur, please contact the webmaster. Site designed by Ireland Graphic Design.